Nyonya laksa, ketam bercili, pie tee, onde onde and kuih kosui gula Melaka among others get star billing at Concorde KL’s Celebrating Nyonya Flavours with Chef Adriana Tan promotion from now until March 26, 2017 at Melting Pot Café. 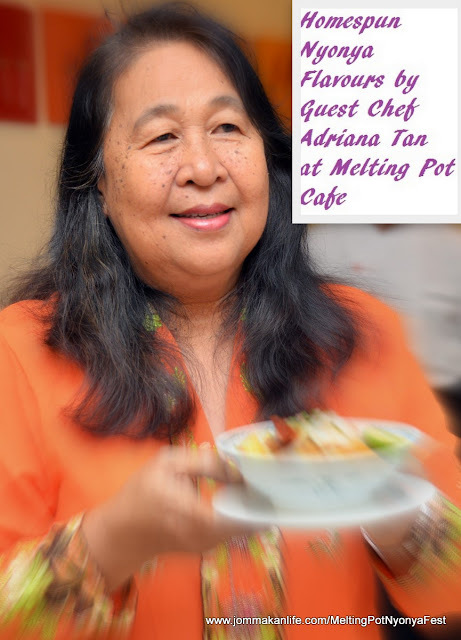 Roping in Adriana Tan from Ayer Keroh, Melaka as the guest chef, Melting Pot will be showcasing an array of homespun Straits Chinese or Peranakan familial recipes in addition to its regular lunch and dinner buffet. The passionate cook who runs a home-based catering business known as Adriana Nyonya Delights, has garnered her own regular following in Melaka, Kuala Lumpur and Singapore prior to her promotional stint at the city hotel. We enjoyed sampling her signature Nyonya laksa - noodles drenched in lemak-rich and well-spiced curry gravy with beancurd puffs, prawns and sambal. Just ensure the chefs stir up the curry broth as it's the warmth that amplifies those aromatic rempah accents. To whet the appetite, we suggest going for the DIY pie tee -- little top hats filled with shredded yam bean. Otak-otak, sambal timun with fish cake and sambal mangga are other notable starters to look out for. Plain rice is called for should you want to appreciate the complex deep-seated flavours of ayam pong teh, chicken curry kapitan, sambal petai prawns, steamed egg with cincalok or asam pedas. Keep your eyes peeled for mee siam perked up with robust housemade chilli sauce too. Main dishes may vary based on the daily rotational menu so certain mains such as sambal sotong, sek ark (braised duck), sambal ketam, chicken rendang or sambal kupang petai may appear in the line-up, depending on your luck. Kuih is part and parcel of the Peranakan heritage hence Adriana has ensured a wide enough variety to satisfy expectations. Proffered in vibrant jewel-like colours culled from natural ingredients like local flowers and leaves, we feasted on dainty pieces of putugal, abok-abok sago, pulut tekan served with homemade kaya and onde-onde. Tempting morsels of kuih ang koo, kuih seri muka, kuih kosui pandan, kuih kosui gula Melaka and apam balik durian were duly 'ooh' and 'aah'-ed over before they were polished off. The Celebrating Nyonya Flavours with Chef Adriana Tan promotion is priced at RM80 nett per person for lunch and RM110 nett for dinner. For reservations or enquiries, please call Melting Pot Cafe, tel: 03-2717 2233.